GROUNDHOG DAY is Saturday, February 2! I simply couldn’t resist … so sorry for those of you who are freezing… but here it goes! What does that mean to you? Well, let’s look into the history of Groundhog Day from Wikipedia. 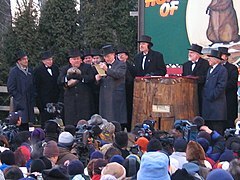 Groundhog Day 2005 in Punxsutawney, Pennsylvania, U.S.
Groundhog Day (Pennsylvania German: Grund’sau dåk, Grundsaudaag, Grundsow Dawg, Murmeltiertag; Nova Scotia: Daks Day) is a popular tradition celebrated in the United States and Canada on February 2. It derives from the Pennsylvania Dutchsuperstition that if a groundhog (Deitsch: Grundsau, Grunddax, Dax) emerging from its burrow on this day sees a shadow due to clear weather, it will retreat to its den and winter will persist for six more weeks, and if it does not see its shadow because of cloudiness, spring will arrive early. While the tradition remains popular in modern times, studies have found no consistent correlation between a groundhog seeing its shadow or not and the subsequent arrival time of spring-like weather. I think this year in particular there is NO CORRELATION BETWEEN THE GROUONDHOG SEEING ITS SHADOW OR NOT AND THE SUBSEQUENT ARRIVAL OF SPRING! What do you think? Do you honestly think he’s going back into this burrow for (at least) 6 more weeks or is he going to come out and freeze his little bottom? And what about those people who wake him up! Surely they are going to be dressed in their winter coats and boots,then wake up the little guy from a sound sleep and expect him to be a happy camper? No way! 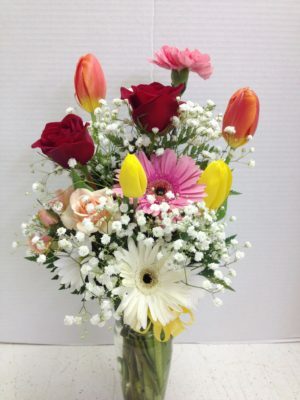 and then spring-time flowers at the flower shop! 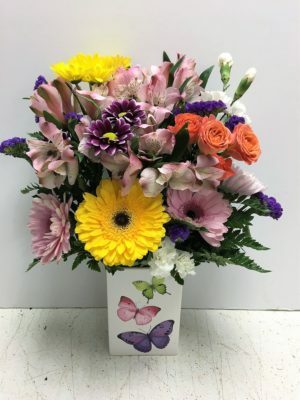 It’s always springtime when we are working with our beautiful flowers! We would like to share them with you every day, whether or not Mr. Groundhog sees his shadow on Saturday!